There are several great beaches in the surrounding area - just beyond the village, a side road winds down the hillside for just over a mile to the lovely uncrowded sandy beach of Avithos. The attractive resort of Lassi, 4 miles away, has two superb beaches of soft pale sand which shelves gently into the crystal clear water. 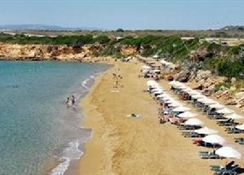 They are thought to be among the best beaches anywhere in Greece (Makris and Platis Yialos). Nightlife and shopping can be found in Lassi or in the larger Argostoli, 7 miles away. The studios have an outdoor swimming pool surrounded by ample terraces with loungers, tables and chairs. The studios have a restaurant serving breakfast, lunch and dinner and a snack bar. These studios will appeal to families and couples looking for a quiet relaxing base from which to explore this beautiful island. 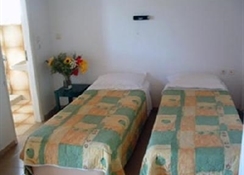 If you are looking for a holiday to the Greek Islands in flexible accommodation with a friendly atmosphere just a stones throw from the beach, this is a popular choice.